Many couples has they plan out their wedding stumble across ads on the internet for beautiful wedding flowers that can be shipped to you at prices much lower than your local florist. These ads are temping with beautiful photos of exotic flowers with unbelievable prices. Unfortunately, there are some dangerous pitfalls that brides to be need to be aware of. Have you ever bought something online that looks huge and gorgeous, but when you get the flowers they are small and dinky? I’m sure we all have at some point. One of the advantages at Knight’s is we carry a huge selection of flowers throughout the week. 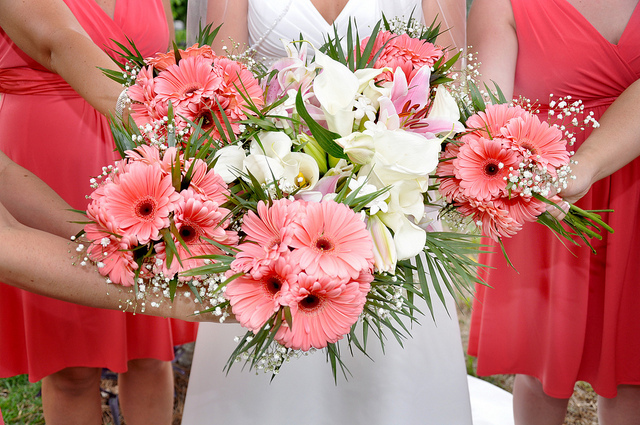 We carry over 30 different variety of flowers in an array of colors at any given time. Many of the flowers that a bride will want for her wedding will be available to see, feel and smell right from our huge display cooler. This prevents any hidden surprises. Two of the most important components of keeping a flower fresh are water and cool/cold temperatures. When flowers have to travel great distances via FedEx they usually get hot (especially in the summer months) and are out of water. By the time they arrive in your home they can be wilted or very stressed. While re-cutting them will revive them, hopefully, the dramatic stress they endured probably knocked several days vase life off the flowers. Buying from a florist like Knights we keep your flowers in a temperature controlled cooler built just for flowers at around 35 degrees and 80-90% humidity so the flowers will be at optimum freshness for your wedding. We also hydrated the flowers in a special solution, plus store them in water mixed with just the right flower food to keep the blooms at just the perfect openness. When you pick up or have your wedding flowers delivered they will be in water with vases we give you. Online wedding flowers look to be like a great deal until you figure in the shipping and other charges the merchant tacks on at the end of the sale. Those bargain basement hydrangeas, once you’ve add up the miscellaneous charges can cost more than you can get at your local florist, especially Knights. We see brides that check our prices out and are amazed just how reasonable we are. Of course, you have to compare apples to apples-size, variety and color. With enough lead time we can get the prices way down, even for the DIY’er. You have your flowers schedule for delivery on the day before the wedding and they haven’t showed up yet. Finally, they arrive really late in the day or worse the day of the wedding. Yikes! Believe me I waited on more than one bride on a late Friday afternoon desperate for last minute flowers for a wedding to replace the flowers that didn’t show up. Talk about panic stricken. At Knights we get our flowers in several days before the wedding to make sure they look great, properly hydrate them, and if there is a problem we have plenty of time to get replacements. OK, you’ve got your wedding flowers in a few days ahead of time to cover for possible problems. Now you’ve got to store them. You planned the perfect set up. Your old fridge out in the garage. This is just about the worst place you can store your flowers. I can not tell you how many brides that have ruined their flowers flowers in these fridges. What’s wrong with old refrigerators? Plenty. First, they may have old odors from leftover food that give off dangerous gases that can kill the flowers. Second, the temperature can vary dramatically from the top part to the bottom part of the fridge. Thirdly, If the fridge is in the garage or warm room the hot moisture from outside come onto the flowers in the fridges and collects on the petals and foliage causes them to turn brown or black…and possible wilt or die. Don’t put flowers in the fridge! Better to put them in a cool draft free dark room. Even better, buy your flowers from a local florist that has state of the art coolers just for keeping flowers. Stick with your local florist. At Knight’s we’ve been doing wedding flowers for over 60 years. When accidents happen, and they will, we are on the spot ready to fix it. Not 1,000 miles away sitting in a cubicle helpless to solve your problem. We help budget minded couples planning a wedding make their dreams a reality with bloomin’ gorgeous wedding flowers without the stress and confusion of what to order. There’s a classic saying among photographers that goes “if you screw up a portrait you need to apologize, if you damage a wedding you will need to leave town”. Both Photoshop and Lightroom have capabilities which the other does not have.